Ever find yourself wishing you had more outdoor dining seats for your guests? Wish no more as the POLYWOOD® Euro Side Chair is the perfect choice to accompany your outdoor dining table. Now you can entertain as many guests as you can fit around your table! 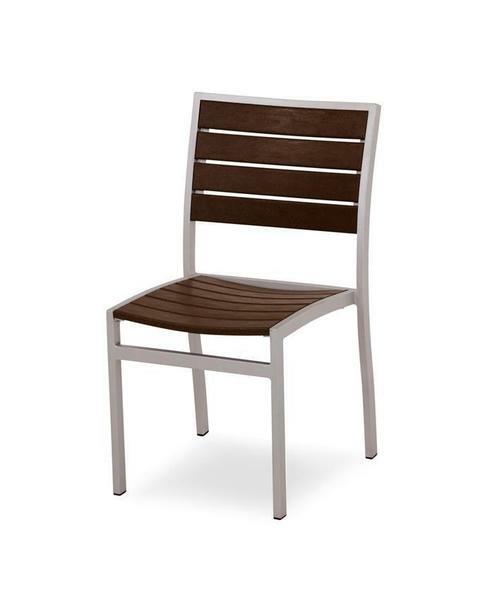 The POLYWOOD® Euro Side Chair brings a new and creative look to your outdoor dining area. The craftsmen who build these chairs feature both polywood and aluminum in their construction of these polywood dining chairs. The result? A truly performance driven collection. We allow you to customize the polywood chair with the wide variety of polywood colors we have to offer to ensure that the chair matches both your dining table and the rest of your outdoor decor. Made in the USA!